No dog will be able to resist holiday dog treats made with a special dog treat icing that will make the treats look glossy and shine! The beautiful holiday dog treats in the photo above were made by Jenifer Coble using Fido's Frosting brand dog treat icing from K9Cakery.com. Not only will your Christmas dog cookies LOOK fabulous, but they will TASTE and SMELL enticing to dogs as well. 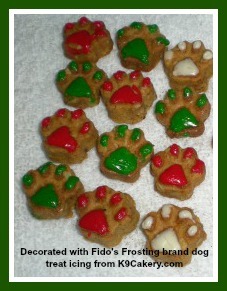 Fido's Frosting brand specially formulated dog treat icing can be easily mixed with water for an instant decoration on the holiday dog treats. The icing will dry hard, and it will dry VERY shiny. It will not melt which is a good thing because when your dog eats a treat, the icing will not become gooey and get all over his mouth or on the rug if he drops a piece. Use your favorite Christmas cookie cutters to make snowmen, candy canes, stockings, Christmas trees, snowflakes, or just regular dog bone shapes. Mix in colored icing powder - green or red - or just leave the dog icing in its natural white color. If you leave it white, the icing will be a smooth and shiny white. When dried, the icing will feel smooth. You can replicate any intricate design that you have seen on a human Christmas cookie with dog treat icing. For example, on a candy cane dog biscuit, use a small paint brush or a toothpick to create stripes of the icing. The wooden stirrers found in coffee shops will do the trick very well. One of the most popular shapes for dog treats is the mini-paw print. There is a photo of a mini-paw print baking pan above. Using dog biscuit mix, you can quickly turn out 15 of these little dog treats at a time. They do look like little paws. 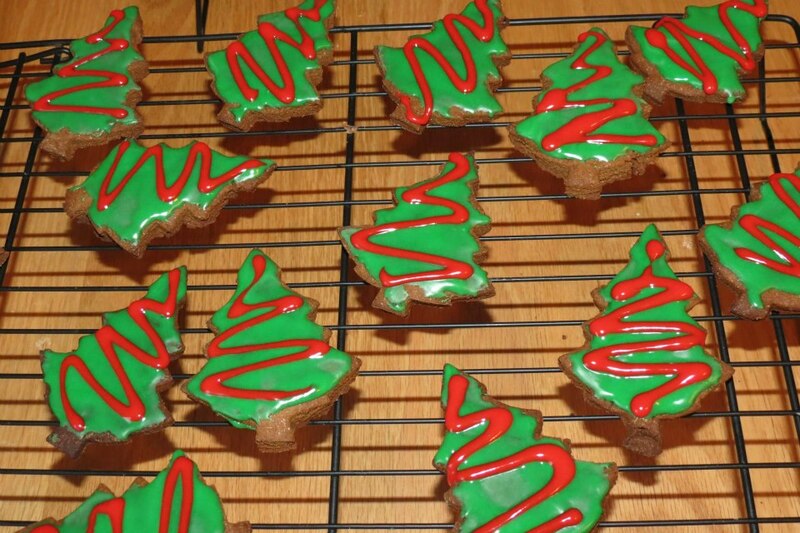 Using Magifrost dog treat icing, make up 3 small batches of icing in red, green, and leave one white. Paint the little toes on the paws in these colors, mixing them up for an all around Christmas feel. 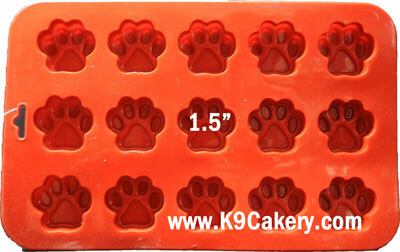 The toes come out raised and will not break off if you use the silicone mini-paw print pan from K9Cakery.com. Wrap up a batch of paw prints brightly colored with dog treat icing in an inexpensive dog bowl, or simply in a dog treat bag or treat box, depending on how lavish you want to be! Include a stuffed toy or a squeaky toy, a tennis ball, and may be a rawhide chew, tie it up with a colorful, sparkly Christmas bow, and you have a Christmas dog gift basket! The fact that you took the time and effort to make homemade dog treats and decorate them so beautifully in order to acknowledge a dog owner's dog will be truly appreciated! It shows thought and caring because let's face it, anyone can go into a pet store and buy a "stocking" full of mass-produced dog treats. A note about the mass-produced dog treats that are sold during Christmas. If the icing is sticking to the packaging, chances are good that candy chips were used which is mainly fat and sugar. The fat will cause melting in warm environments and you will be giving a gift of goo.